I love a really rich and hot Asian flavored soup, especially one that includes tender slices of beef! You can add noodles or rice and whatever vegetables you happen to have on hand. Think of this recipe as a starting point and feel free to add or delete things at will to make it your own personal comfort food! In a pot combine all ingredients other than green onions and steak and let it simmer together over medium heat to blend the flavors (about 20 minutes). While that is cooking, cut your steak into very thin slices. Once it’s cut, pound it very thin with a meat mallet. In a wide shallow soup bowl, line the bottom with the raw steak slices. Crank up the soup temperature to high until it comes to a boil. 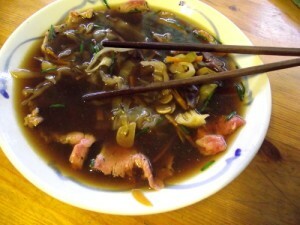 With a ladle, spoon hot broth over steak slices and garnish with green onion. As the steak is so thin the broth will cook the meat perfectly while still being tender.